The Yates Uniform Rappel Belt has become standard equipment for SAR teams, firefighters, and SWAT officers in the USA. This lightweight uniform rappel belt can be used for emergency rappels and belays, but is not intended to replace a harness. 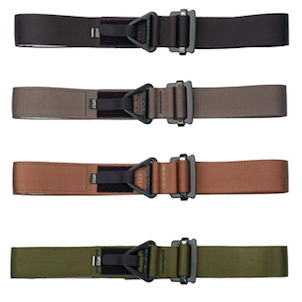 The Uniform Rappel Belt has a unique custom “Cam Lock” waist buckle system that allows for quick adjustment while eliminating slippage problems. Please note that this belt is not intended as a substitute for a harness. Meets “TESTING STANDARDS” for NFPA (National Fire Protection Association) Standard for Fire Service Life Safety Rope and System Components. (1983/1995 Edition) for Class 1 Emergency Escape Belts.